Bec + Bridge has been a firm favourite in our wardrobes since it launched in 2003, and we're so excited to have the Australian brand included in our Who What Wear VAMFF runway show on March 8, 2019. If you're yet to pick up tickets, secure your spot before its too late. In the meantime, we sat down with the label's co-founders Becky Cooper and Bridget Yorston to chat about how they launched the label, where they find inspiration, and what we can expect from upcoming collections. Read on. What was your experience before launching Bec + Bridge? 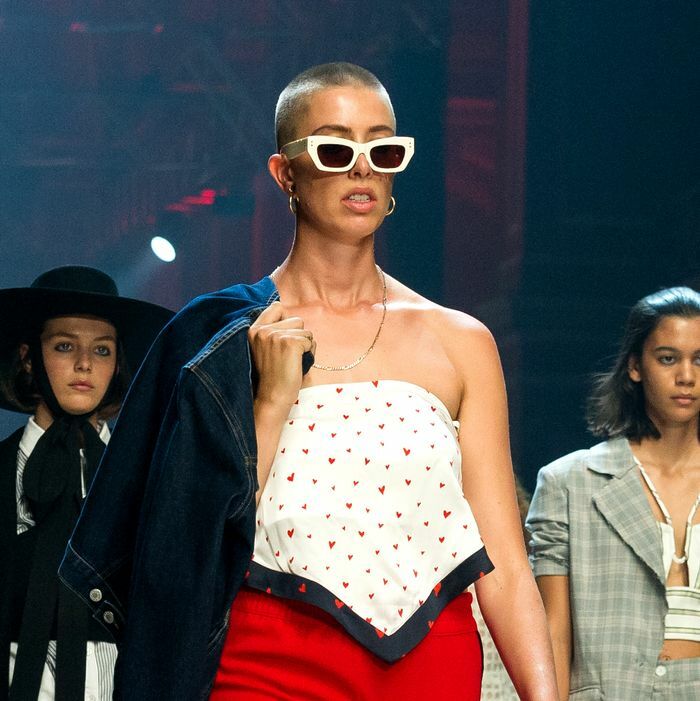 Becky Cooper and Bridget Yorston: We met whilst studying Fashion Design at The University of Technology in Sydney, so we always had a huge love for fashion, though neither of us would’ve had the confidence to start a label on our own. It was definitely our firm friendship and the fact that we worked so well together that prompted us to give it a go. We were also very young when we started our label so in our minds, we had nothing to lose. If it worked, great! But if it didn’t work, that was OK too. How long did the process take from when you initially had the idea, until you had the finished product in hand? B&B: In those early days, we never really sat down to discuss starting a brand. Our label began by chance when we were just in our second year of studying fashion design back in 2001. We’d been asked by a friend to revamp his old pair of jeans. We got busy ripping, printing, dyeing, stitching and spray painting the jeans in an attempt to resurrect them. He wore them out that night and they were such a hit amongst his friends that orders started coming in. Soon after, we had stores calling us to place orders. Naturally this forced us to get our act together and make things official. It was a case of one thing leading to the next. Before we knew it, we had our names on garments hanging in stores. When did you realise Bec + Bridge could be a full-time career? B&B: When the wholesale orders started to roll in from Australian boutiques and we were fortunate enough to be picked up by major Australian department store David Jones. This all happened fairly soon after graduating from design school. We definitely had our fair share of tough years where the two of us were literally doing everything —designing, producing, selling and dispatching our collections. We’re exhausted just thinking about it… lucky we were so young and resilient back then! Who is the woman you’re designing for? B&B: We don’t really believe there is an ideal person as such. We love how diverse Bec + Bridge women are and we celebrate this. Someone once described the brand to us as being all about ‘Girl Power’ and we’d agree with this sentiment —we’re about making women feel confident and modern and we love the idea of women supporting other women. Where do you continue to find inspiration, season after season? B&B: It really depends on the season we are designing for. It can be anything from specific artists to musicians, it could be about a place or a face or an amazing print that can inspire us and set the tone for an entire season’s creative direction. We often refer back to timeless muses such as Bianca Jagger, Lauren Hutton and the super models of the 80’s and 90’s whose style is still relevant today. If you’re feeling ‘stale’, what do you do to re-energise creatively? B&B: Spending time at art galleries, travel, reading, looking through fashion archives, hanging out with other creative people… all of these things can help reignite the flame. What can we expect from Bec + Bridge in upcoming collections? B&B: Our collections are getting bigger and more diverse with every season. Colour, print and texture play a strong part in every collection. What’s your message for other women who look up to you both and hope to start a fashion brand one day? B&B: Teach yourself to be patient because everything takes longer than you think. Also, don’t become too fixated on an end goal… be prepared to learn and grow on the way. Who What Wear Is Returning to VAMFF Next Week—Do You Have Your Tickets?